The Blog of Thog: Farewell Ceefax! Tonight a mark of culture ends. 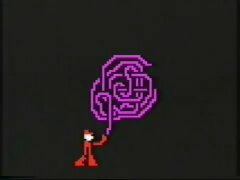 The 4-Tel man with the logo all crumpled up into a floating ball. Yeah. Back as a teenager, I remember playing Bamboozle on Channel 4. The Bamboozle guy was kinda freaky. And getting the latest gaming news on Digitiser. It's probably hard to explain to younger folk who probably didn't really ever use Teletext or Ceefax, but it was kind of the Internet of its day. You went to certain pages by typing in a three digit number, and I remember typing in random numbers to see what came up. The 700s were usually pretty interesting simply because they were pages that didn't have the normal stuff on eg news, weather, sport. For more teletext remembering go check out http://www.mb21.co.uk/ as well as the websites listed at the end of this post.